Although the live event has passed, you can purchase the rebroadcast of this webinar below! While my retouching is a 3-step process "Fix", "Balance" and "Enhance", I have by far the most fun with "enhancing" an image. With my analog-styled images I use various "actions" (not Photoshop actions) that achieve the final effect of what you see here. – How do you achieve that faded out look over to make it look like a printed image? – How do you create your light leaks? – How do you decide when to use certain effects? – How do you use effects for censoring images? – How do you get those film grains and scratches on your images? – How do you decide whether to use the image alone or combined with another as a diptych/triptych/etc.? – How do you sharpen or blur and when do you do that? – While size/format/color space do you render the images? This will be a Photoshop and Lightroom intense workshop with lots of discussion, demonstration, and Q/A. I will reveal the images here in their full-layered format and go step-by-step through how the effects were created. Then I will demonstrate live how I put the finishing touches on a new image from scratch. This is a "no-holds-barred" workshop on my light leaks, grains, scratches, and other effects that I use that I don't even have a name for. If you've ever wanted to know how and why my images look the way they do, this is the ticket! This is a rebroadcast of the live workshop from February 24, 2013. The payment for the rebroadcast lets you register an account that can access the rebroadcast from lucima.com indefinitely. So you can watch it as often as you want and as many times as you want (as long as you don't share the video). You will also have all the controls that Vimeo provides; play, pause, fast forward, rewind, HD 1080, etc. -Check out the rebroadcast of the Working with Modeling Agencies Workshop from January 2013! 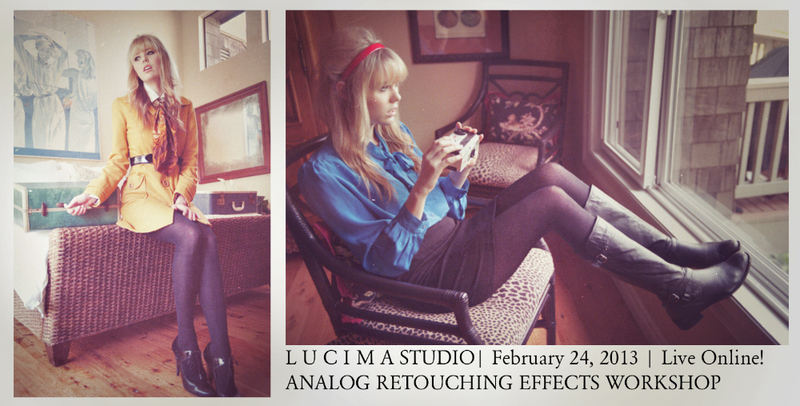 -Check out the rebroadcast of the Image Selection & Retouching Workshop from December 2012! Check out the rebroadcast of the Managing Location Lighting Workshop from April 2013! Check out the rebroadcast of the Model Direction/Interaction Workshop from April 2013! Check out the rebroadcast of the Adobe Camera RAW Adjustments & Balancing Retouching Webinar from June 2013!